- This backpack from Kuttu is an absolute must-have. Specifications Size: 14" x 19" + 5.5"
Description : Travel Backpack bag in Denim with Leather trims. Exterior has a slip and a zipper pocket at the front. Interiors has a zipper and two slip pockets.Adjustable Shoulder Straps in Genuine Leather. - Size: W 19" x H 15" x G 4"
This is a bag with real difference.The denim leather combination with defined quilted stitching lends that awe inspiring look. - Material used are denim and leather. - Well defined quilted stitching. - Numerical lock for extra safety. For catering the variegated needs of our clients, we are deeply engrossed in manufacturing a qualitative array of Jeans Bag. Owing to the dedication of experts in our team, we are engaged in making Denim Bags at lowest rates. They are fancy and available in many specifications. 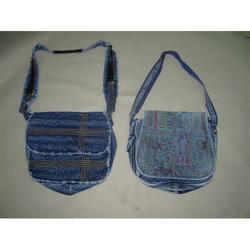 We offer a collection of Fancy Jeans Bag which is available at industry leading prices. 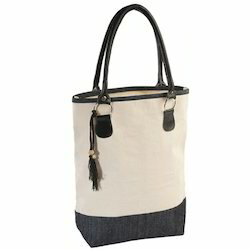 Jeans Bag is manufactured using premium quality raw material and are available in various shapes, sizes and finishes. Our range of bag is widely used for the various shopping purposes such as like vegetables and other daily items.